WELCOME TO ANTIQUES AND MOORE! 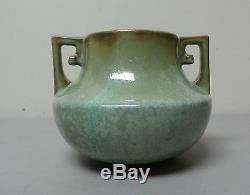 This listing is for a lovely antique Fulper Art Pottery vase, #452. This stunning vase has beautiful green coloration in the "cucumber crystalline glaze" which is a lovely seafoam green with copper dust accents at top and on handle. This shape is generally called a "squat buttressed handled" or "Arts & Crafts style" vase and is identified as shape #452 and called a "two handled jar" in the Fulper catalog by Hibel, DeFalco & Rago. The vase in excellent condition with no noted damage or flaws. Measures 4 3/4" high with a top diameter of 3" and a maximum width of 5 3/4. The item "ANTIQUE FULPER ARTS & CRAFTS ART POTTERY VASE #452, c. 1916-1922" is in sale since Wednesday, July 8, 2015. This item is in the category "Pottery & Glass\Pottery & China\Art Pottery\Fulper".